After spending the Festive Season eating & drinking with abandon, the past couple of weeks I thought I’d get back on a better track before entering the zone of austerity when 12WBT starts with gusto in a couple of weeks. To say Jay enjoys barbecuing would be an understatement. Any day that it’s sunny and warm he’s straight out on the grill to BBQ up a storm. I don’t mind; I play prep-chef and he does the cooking! We usually do lean meat (lamb fillet, beef steak, chicken or fish in foil packages) with an array of veggies (corn, zucchini, capsicum, mushrooms, onion, etc) and often a nice zingy salsa. 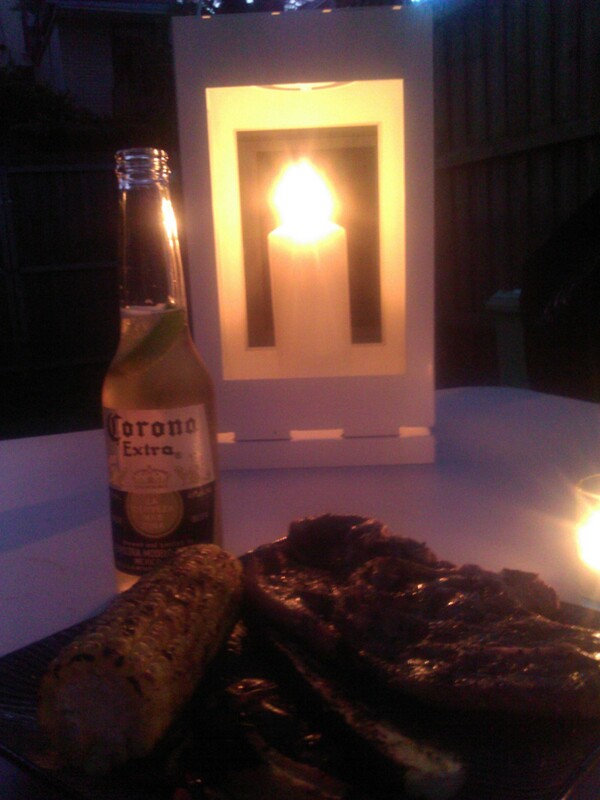 This particular weeknight we did lamb chops with corn and zucchini.Yum! I’ve placed a 3-month embargo on our regular cafe (FFF). Jay is a total creature of habit and I am not, so the only way to get him to try new places to eat weekend breakfast is to do it by force! Fountain77 is also local and on a rainy morning we stopped in for some sustenance. I had poached eggs, rocket, bacon, ricotta & avocado on sourdough. The serving is huge but the coffee is decent and the food really fresh! I am one of those people who naughtily never take a lunch break. I’d rather just motor through my work and eat at my desk. 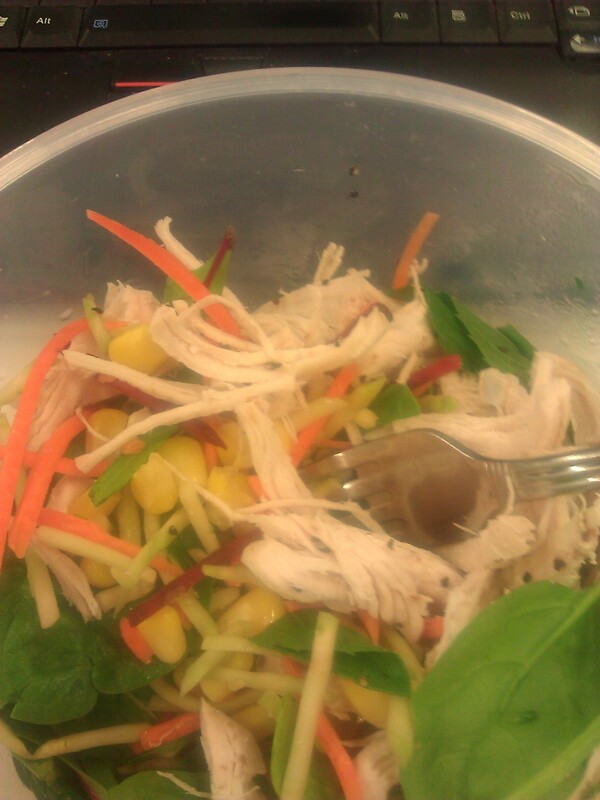 First day back last week I had a homemade poached chicken salad. At my desk. You know I’m obsessed with burgers. They really are my favourite food but since I’ve adopted Michelle Bridges as my guru they’re generally not on the meal plan (unless they’re the Cheeky Charlie version), but I’ve found that if I share a burger with a like-minded friend I don’t have to go without! 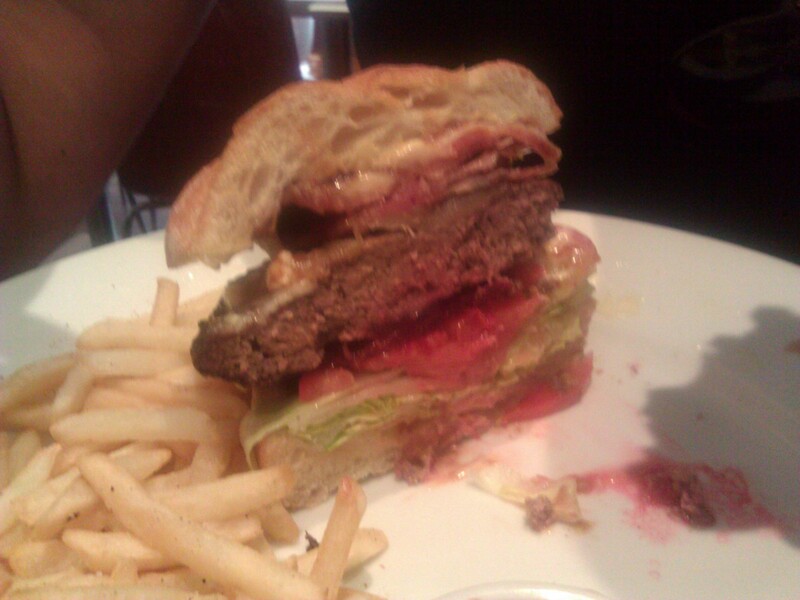 My work friend Mands & I discovered the ‘OMG Burger’ at The Brooklyn in the city. It really is Oh.My.Gosh. (or OMFG) and we split it! and create a ‘haystack’ of joy! Yum! Yay for FFF embargo! 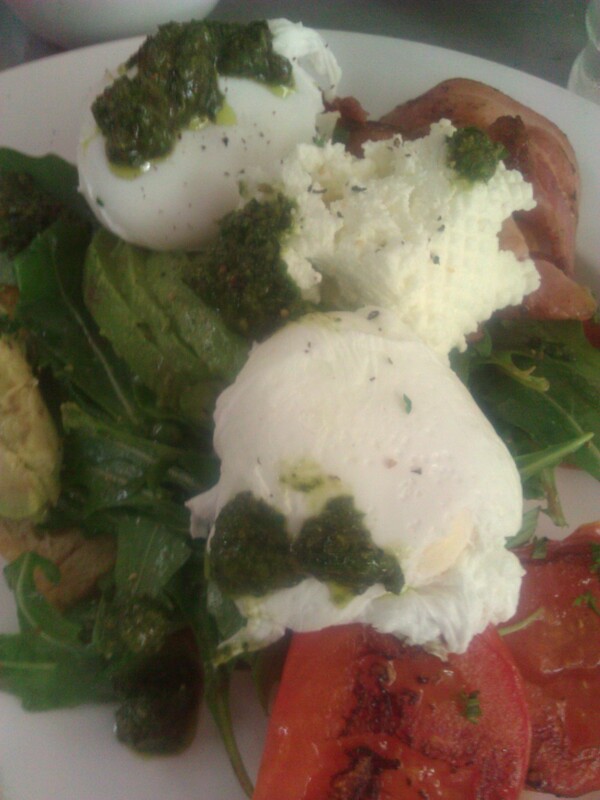 We went to Frames Cafe in Surry Hills for a spot of brunch. 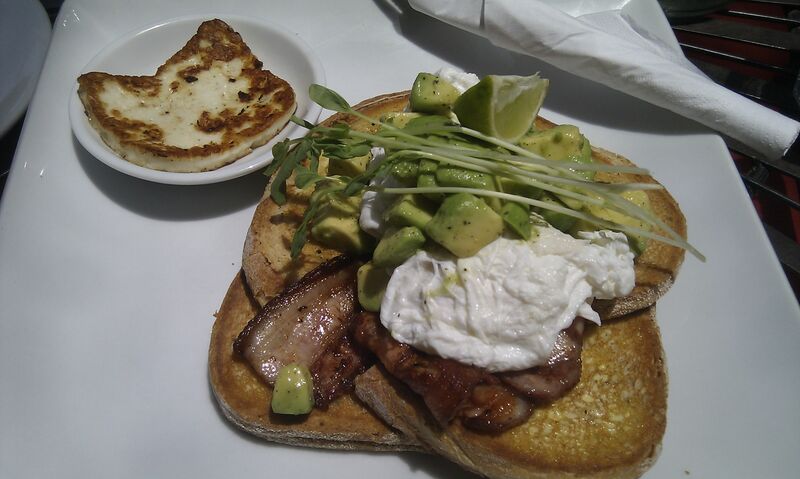 I ate sourdough with poached eggs, bacon, avocado & haloumi. The coffee was exceptional! Gracie, Jay & I went for mid-week dinner at Goen Japanese resutoran in Glebe. 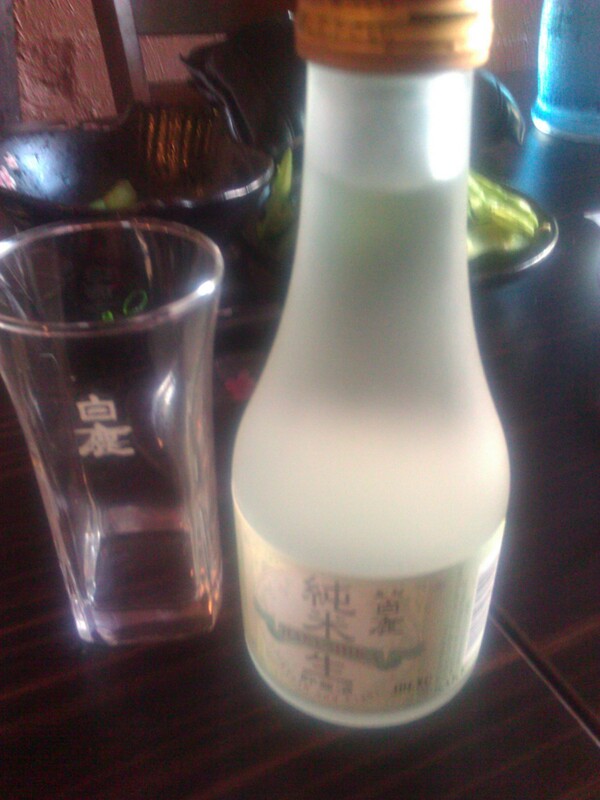 We ate gyoza, edamame, sushi, sashimi, beef teriyaki and drank Asahi and sake. 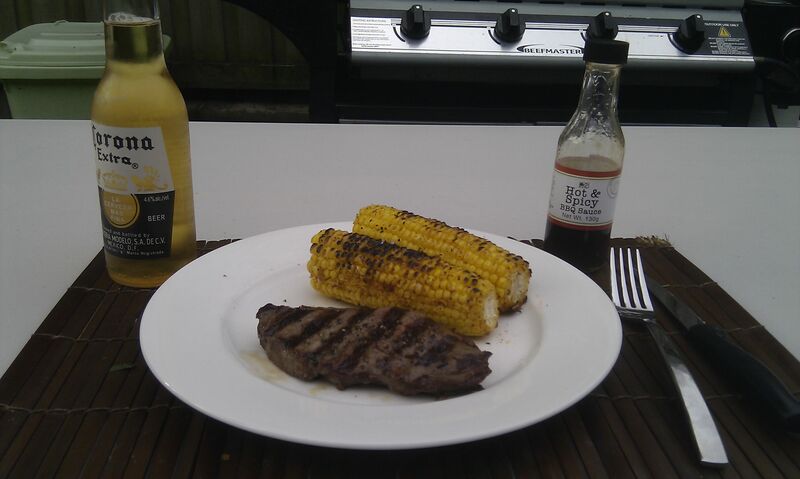 Another weeknight BBQ and Jay cooks up delicious scotch-fillet steak with corn Mexican-style (chargrilled with spicy herbs). Now this is my kind of treat-meal! Goats brie and goats cream-cheese with chives, sausage, figs, strawberries, dukkah with olive-oil/balsamic for dipping, chickpea chips & olive bread. 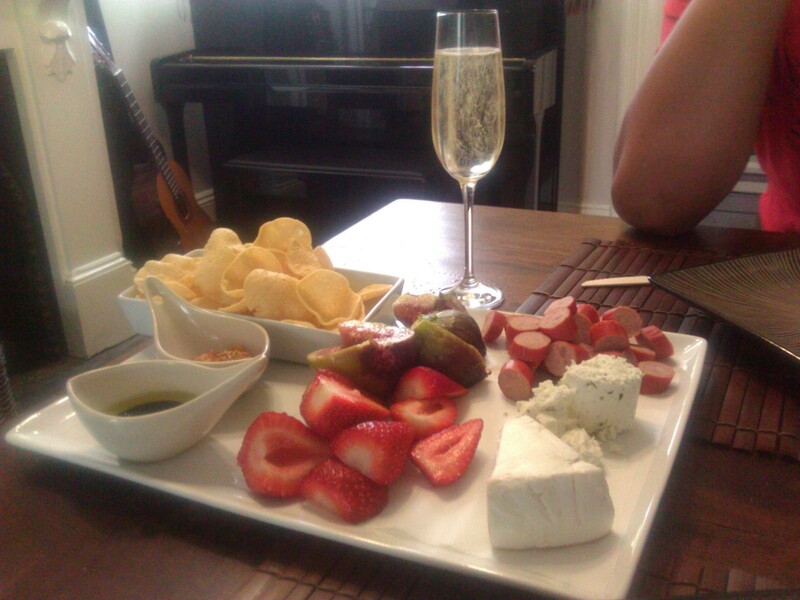 Served with sparkling bubbles of course! Inspired by Mich to eat the leanest & highest-protein meat, I decided to reattempt a past failure of cooking Kangaroo, for dinner the other night. 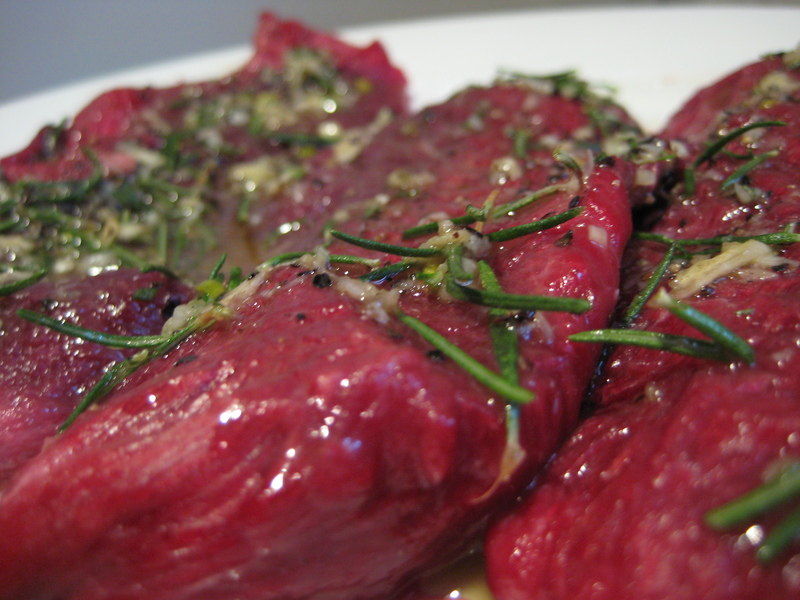 I marinated Skippy Kangaroo fillets in rosemary (from my garden! ), garlic, pepper and olive-oil. 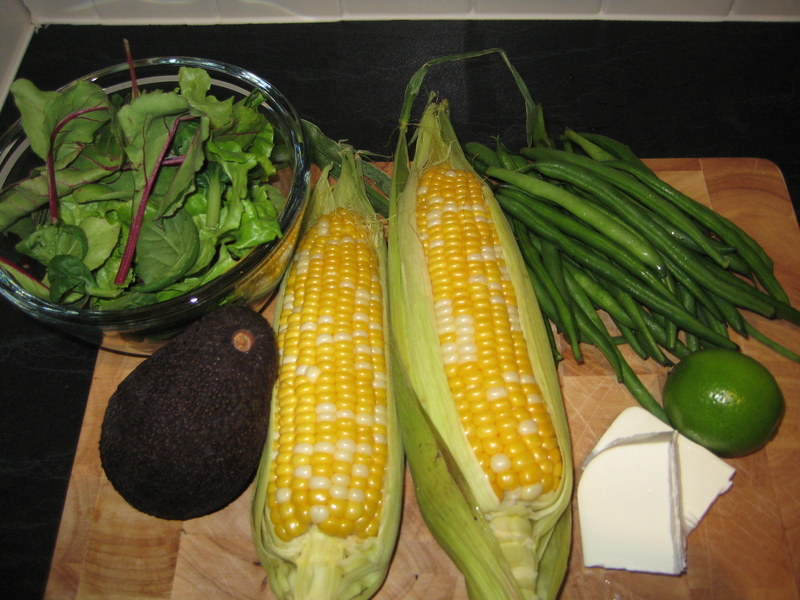 I seared them on the skillet and served them with corn, steamed beans, avocado, greens and feta. Yum! 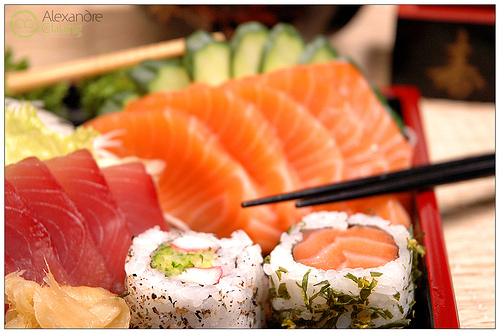 I regularly eat at Tomodachi in Broadway shopping centre. It has my fave sushi train but I tried the small sushi and sashimi platter there while running errands. This all looks so yum! I’m so amused you have put an embargo on FFF. I get it though, I’d try a new place every week if I could (says she who just blogged about going to the same cafe three times in a row!). 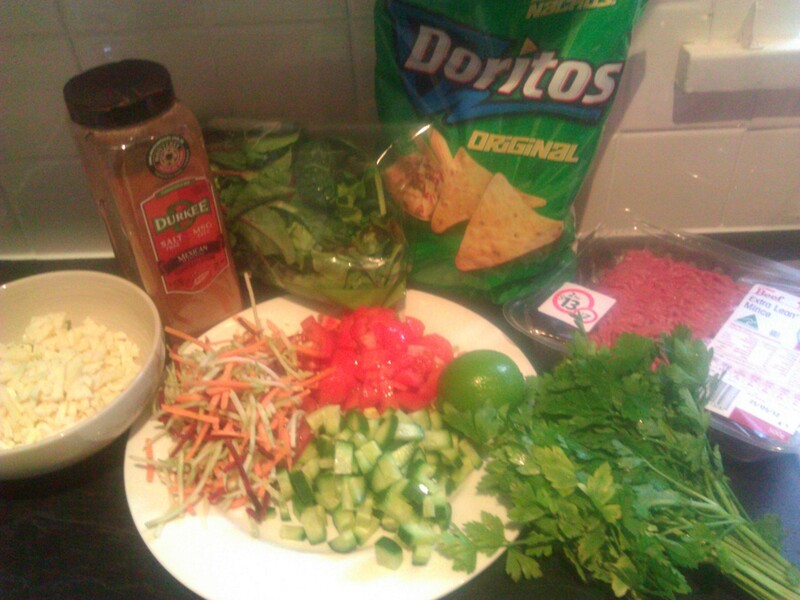 I’m intrigued by the haystack… must try something like that (though cornchips are a huge danger food for me!). 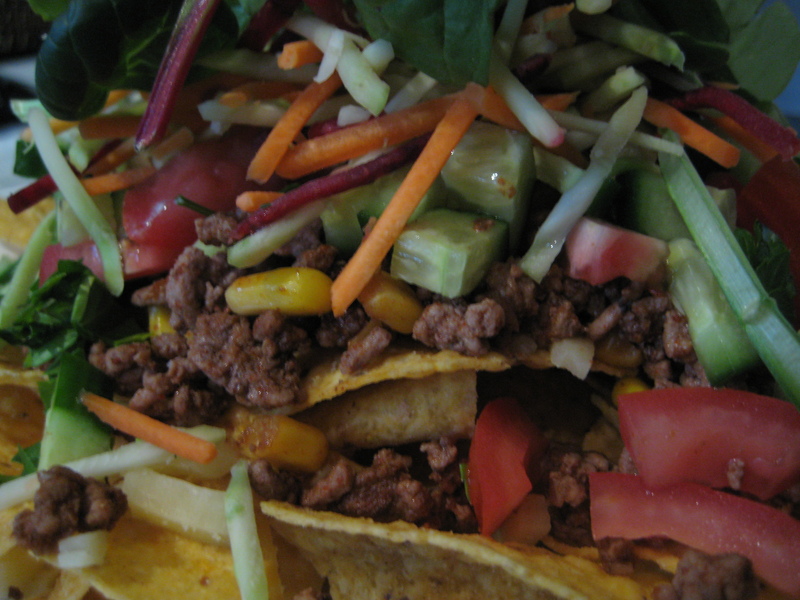 think of it as a healthy nachos without all the melted cheese & sourcream (there are some of that but its only a few tablespoons). 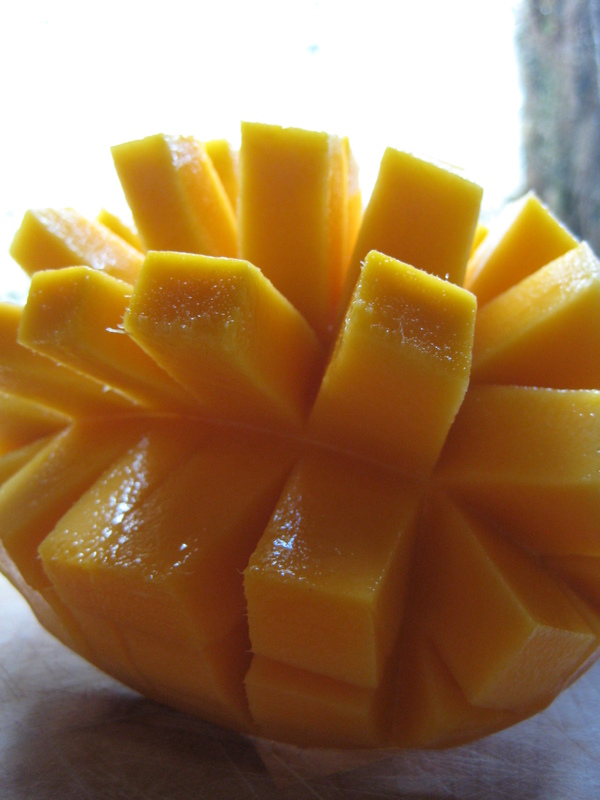 give it a go, maybe it can be the way you eat your corn chips (in portion control)! Ah, haystacks. It reveals your hidden past! There is nothing that says Sabbath lunch more than haystacks. I believe they were invented by some midwestern Adventist wife, because they are the universal food of Adventists. In fact, I had them for lunch last Sabbath. With Leighton Heise. Don’t get more SDA than that.